We build custom mobile apps. You enjoy your business growth. User Experience Specialists Our UX specialists help our clients create unique product experiences that better connect with customers. The UX team is involved in nearly every stage of the app development process from initial concept to final output. Developers Our developers turn designs and ideas into actual, usable products. Our team of technologists and developers have a wide range of skills, including creationof native mobile applications on iOS and Android, and R&D of new technology. 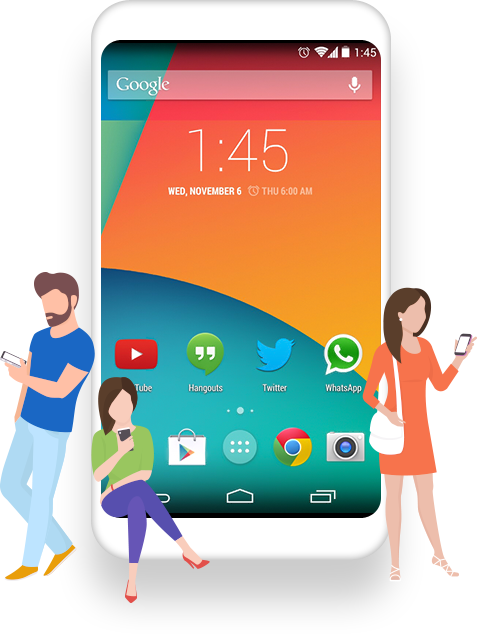 UI Designs That Conform to All Native Platforms Our UI designers are well-versed across both Android an iOS. With their wide range of experience, they will create an application with the appropriate UI design to appeal to your customers and create a pleasant novel experience across all mobile platforms. Project Management Our client relations team helps clients ensure we deliver projects on time with the highest level of customer service. Our project managers are the liaisons between your stakeholders and our team, bringing products and experiences to life for your brand and customers. Why Us? Our design and development teams are highly experienced in producing a wide range of apps across various verticals. What makes the Mobikasa team different is really love for accuracy and speed when developing the product. With tablets and smartphones on the rise, nearly half of all internet users access online content from their mobile devices. If your website is not optimized to be viewed on mobile devices, then you may be losing customers. We design web sites that can be viewed on desktops as well as mobile devices. With the global use of mobile devices, high-quality mobile apps are essential to the success of your web strategy in today’s marketplace.